Samsung has come up with a unique mobile phone that works with good environment motive. 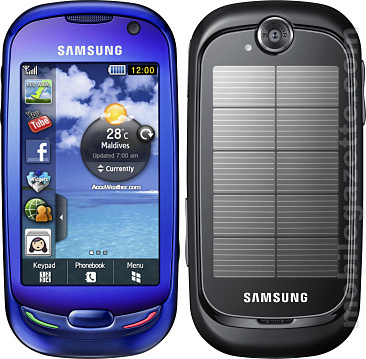 The new Samsung S7750 Blue Earth that is developed keeping the environment friendly aspects in mind. The entire packaging of the phone including the body is made up of recycled materials. There is a solar panel in the device that increase the battery life of the phone and saves energy. Samsung S7750, apart from the above mentioned unique attributes the phone comes with few superbly attractive features and functionalities. The mobile phone looks extremely cool and fresh. The blue colored body on the front side with huge 3 inches TFT capacitive touch screen is just awesome. This capacitive touch screen includes 256,000 colors and a resolution of 240 x 400 pixels. Also there are few smart features such as smart unlock, turn to mute and accelerometer sensor. The overall dimension of the Samsung S7550 Blue Earth is 108 mm x 53 mm x 14 mm and its weight is 118.9 grams. Samsung S7550's camera, 3.15 mega pixel, can click images at 2048 x 1536 pixels resolution and can shoot video clips of QVGA resolution at 15fps. The camera includes Picture Album, Picture Geo Tagging, Face & Smile detection and several other camera settings as well. MPEG4, H263, H264 & WMV video files and MP3, WMA & eAAC+ music files are supported by the presented video player and music player of the phone. Samsung S7750 is a high end device and it carries several high end attributes like flawless data sharing and connectivity technologies including 3G HSDPA, HSCSD, WLAN Wi-Fi, Bluetooth with A2DP, USB, GPRS and EDGE.WAP 2.0, X-HTML and HTML are the provided Internet access technologies given.